Hello fellow book lovers of the world, and Welcome back to my latest book blog. This blog is about The Belles by Dhonielle Clayton which came out Feb 6th from Disney Hyperion Freeform books. I was blessed enough to receive an ARC, but sadly I was not able to get to it before the release date. I am sincerely sorry for this review being up late. But on the 6th of Feb, I bought the audiobook to listen too because I have wanted to read this book for so long. I am so happy I decided to buy the audiobook, now onto the summary and my final thoughts of this book. This book starts out explaining the History of the Belles, Such as the main Character Camille. It talks about how Camille was raise to only take care of the Royals. That it is the job of the Belle’s to always look out for the Royals. But Most Importantly One Belle would be chosen to be at court with the King and Queen. She would be called the Favorite Belle. This big ball happens and the Belles are set out to perform so the favorite Belle is chosen. 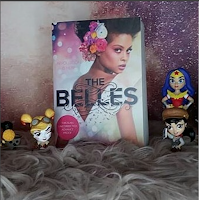 At first, the Favorite Belle that is Chosen is Amber, Camille Adopted Sister, but then things happen that cause Camille to become the favorite Belle of the Royal Family. As time goes on Camille discovers that being a Royal Favorite Belle is not all that its promoted to be. She finds things out about her Belle heritage that might end her life along with things that might end the life of the Royal Family. But in order to know more, I really suggest you buy the book, now onto my Summary. I rated this book a five out of five Stars. I love how Dhonielle had us guessing at every turn about who is really telling the truth. I love how Camille is so curious and doesn’t give up. Even when she is being threatened by people she still continues to want to help. There is so much mystery and intrigue throughout this book, that it makes you wonder who will be the next person to be hurt. People are falling in love with People that they should not be. But throughout the whole Book Camille just has this gift about keeping her head held high. I also love how colorful this book becomes through Dhonielle words. She describes a very French inspire royal era that takes place in New Orleans and its just breathe taking. I love how colorful she makes the ladies fashions but also how she adds a bit of Margaret Atwood “Hand Maiden Tale” to this book by describing this beauty is pain aspect of the world. She goes into depth about how these characters will do anything to be as colorful as the rest of the world. She really gives us a strong deep look at the Beauty world even in today modern society. I honestly could tell you so much more about this awesome book but I will leave it to you to read it. I really suggest you do read it because it is one of my latest favorites of 2018. I can tell that this book will be apart of a series simply because of how it was written and I am already dying for book two. This book is amazing and Now I want more. Once again thank you Disney Books for the Arc and I am sorry for not reviewing earlier. Please go out and buy this book. As always all of the links will be listed below for the book, the author, and my Social media. Please Share this blog.